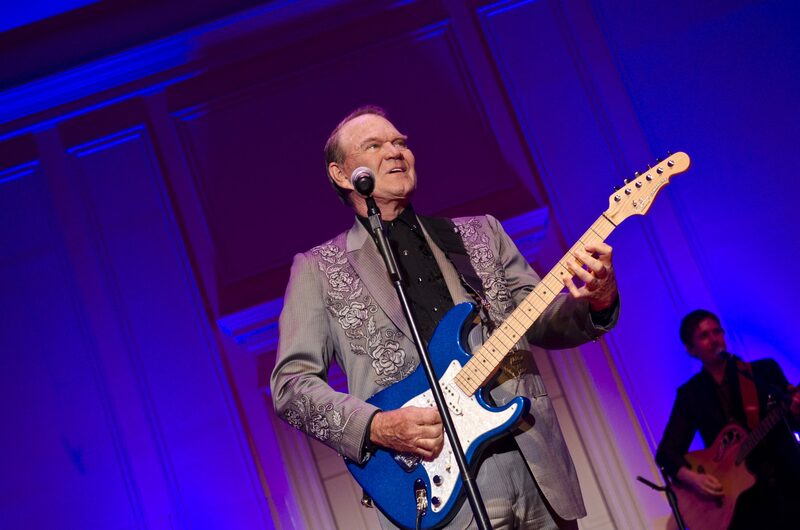 Country legend Glen Campbell will always be remembered fondly by his fans for such hits as “Rhinestone Cowboy.” But for many of his fans who suffer with dementia, his greatest legacy will be his decision to become the public face of Alzheimer’s disease. Campbell passed away last Tuesday at the age of 81, after what his family called a “long and courageous” battle with Alzheimer’s disease. The 151-show farewell tour was also captured in the award-winning documentary Glen Campbell…I’ll Be Me. The film gave fans insight into Campbell’s struggle with Alzheimer’s. It also highlighted a guitar talent that remained supreme in spite of his declining memory. And the singer had the support of many on the road. When he forgot song lyrics, crowds of admirers happily filled in the blanks. His dedicated band (also family members) helped him through any forgotten chords. In an ultimate display of courage, Campbell released the intensely personal “I’m Not Gonna Miss You” in 2014. His final song, written for the documentary, shed light on the way he and his family dealt with the diagnosis and heartbreaking health concerns. The accompanying music video not only shared scenes of his final onstage appearances. It also included video of hospital visits and intimate family photos. Campbell, rather than hiding, dealt with his illness just as he had relationship troubles and addiction struggles earlier in his life. He chose to face the disease head on, and not let it define or control his journey. His bravery helped put a face to Alzheimer’s, bringing more light to the deadly disease. Alzheimer’s is the sixth-leading cause of death in the United States today. It is a type of dementia that causes problems with memory, thinking, and behavior. As Alzheimer’s is a progressive disease, symptoms usually develop slowly and get worse over time, eventually becoming severe enough to interfere with daily tasks. Unfortunately, there is no known cure for Alzheimer’s disease. But Campbell found a way to live life to the fullest after getting his diagnosis. Country star Tim McGraw was set to perform the Oscar-nominated “I’m Not Gonna Miss You” at the year’s awards ceremony. Glen Campbell’s public fight with Alzheimer’s disease will always be remembered as true strength. He showed remarkable fearlessness and has no doubt encouraged those with the disease to fight back and live life to the fullest. Hall, K., “Glen Campbell’s public Alzheimer’s battle set his legacy,” ABC News, August 8, 2017; http://abcnews.go.com/Entertainment/wireStory/glen-campbells-public-alzheimers-battle-set-legacy-49103974, last accessed August 10, 2017. Flock, E., “Glen Campbell’s last song chronicled his struggle with Alzheimer’s disease,” PBS News Hour, August 8, 2017; http://www.pbs.org/newshour/art/glen-campbells-last-song-chronicled-struggle-alzheimers-disease/, last accessed August 10, 2017. “What is Alzheimer’s?” Alzheimer’s Association; http://www.alz.org/alzheimers_disease_what_is_alzheimers.asp, last accessed August 10, 2017.